Three world-first studies on yoga in the workplace have suggested that Dru Yoga is highly effective for reducing stress, easing back pain, boosting wellbeing and lifting your emotions and quality of life. In 2013, Dru Yoga was cited in the British Journal of Sports Medicine as an effective component of a successful injury prevention program developed for professional athletes. More recently, the Dru Back Care program has been introduced for National Health Service (NHS) employees in the UK. The preliminary results from this study indicate that the Dru program resulted in fewer sickness absence days due to musculoskeletal conditions and back pain. A full economic evaluation will be published later in 2015. In the first study, a team of researchers working at Bangor University found that a six week programme of Dru Yoga reduced anxiety and fatigue, while increasing emotional well-being and resilience to stress. A subsequent larger study corroborated these findings and added evidence that Dru Yoga is effective for reducing back pain in the working environment. This research is very timely as latest figures suggest that stress in the workplace is currently costing Australian organisations more than 14.8 billion dollars per year and that 25% of workers have taken time off for stress related reasons. Experts believe these figures are continuing to rise. In the first study mentioned above, researchers conducted a randomized controlled study. This was the first robust research done on yoga in the workplace and involved 48 university employees who were either placed into a Dru Yoga programme or wait listed as the control group. The yoga group participated in a six week programme of Dru Yoga which involved attending a 60-minute class at least once per week. 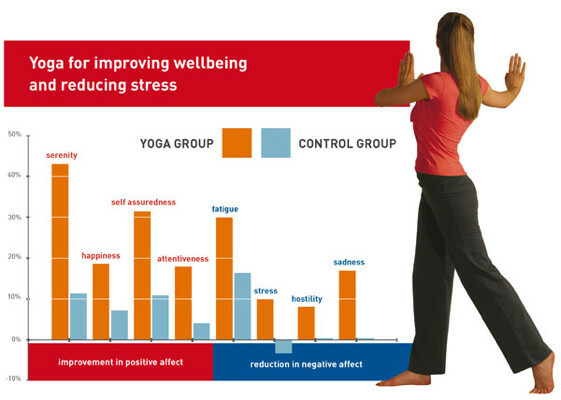 Results showed that the Dru Yoga group reported feeling significantly less anxious, unsure, confused, tired, and depressed than the Control group who did not practice Dru Yoga. In addition, the yoga group reported feeling more life purpose and satisfaction, and experienced greater self-confidence during stressful situations. Researchers concluded that even a short program of Dru Yoga is effective for enhancing emotional well-being and resilience to stress in the workplace, and recommended that employers should consider offering yoga classes to their employees. Dru Yoga is one of the most popular forms of yoga, comprising of easy-to-learn flowing movements, simple breathing techniques and effective relaxation methods.